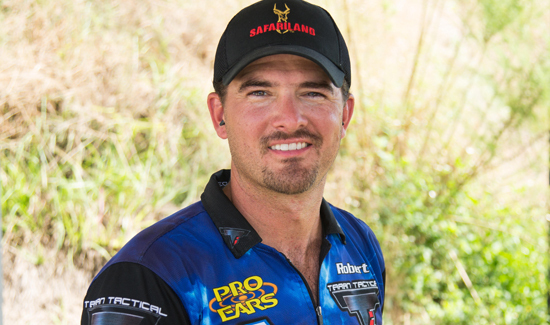 ONTARIO, California – Safariland®, a brand of The Safariland Group, congratulates Safariland Team member Robert Vogel for his win of the Stock Service Pistol (SSP) Division at the 2017 IDPA Indoor Nationals held Feb. 23-25 in Springfield, Mass. Up against a field of respected international competitors, Vogel dominated the entire match, coming in with the highest score of 204.84, defending his title for the 10th year in a row. In addition, Vogel received the award for the best accuracy. Known for its challenging low- and no-light stage scenarios, the IDPA Nationals has 14 stages with a round count of 212+, challenging competitors of all skill levels. Vogel competes in IDPA competitions with the Safariland holster model 5199-683-411, Open Top Concealment Belt Clip Holster with Detent, model 773-83-131, Single Magazine Holder mounted to a 744BL Belt Clip, and model 032 Range Belt. For more information about Safariland, please visit www.safariland.com/dutygear. The Safariland Group is a premier global provider of trusted, innovative, high-quality law enforcement and security products for the public safety, military and outdoor recreation/personal protection markets. Offering many of the world’s most recognizable names in these markets, principal brands include Safariland®, ABA®, Second Chance®, Bianchi®, Break Free® and Mustang Survival®. Forensics brands include Identicator® and NIK®. The Safariland Group’s mission, Together, We Save LivesTM, is inherent in the lifesaving products it delivers. The Safariland Group has its headquarters in Jacksonville, FL.